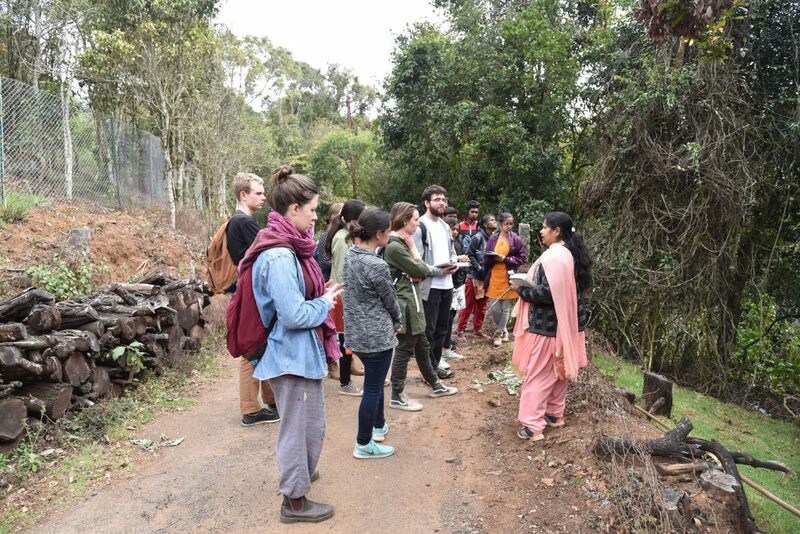 Shiny teaches our group about native species before we enter the Longwood Shola, a protected forest area in Kotagiri. I’m not very squeamish about critters, but the spider I woke up to on morning three would probably make most people uneasy. It spanned slightly larger than the size of my palm and was black and hairy. Friday night, I awoke to some great commotion over yet another eight-legged visitor, this time a poisonous one even bigger and hairier. This one, we’ll call it Shaalini’s spider, was intent on trapping her inside the bathroom (yes, it positioned itself on the door). Needless to say, I’m just about ready to start mopping our floors with peppermint tea (did you know spiders hate peppermint?). Indeed, we have some bugs, but our living conditions are far from rustic. We arrived to find comfortable beds, tea kettles, fuzzy blankets, and yes—toilet paper in our bathrooms. However, the paper is not to go in the toilet, so we’re heavily encouraged to use the handheld bidet (which is a first for many). There’s a showerhead, but we’re told to take bucket baths to conserve water. During my first bucket bath, one could hear shrieks coming from the bathroom. I kept turning on the shower by accident and shocking myself with cold water. Every day my bucket bath becomes a little more graceful. I haven’t checked in with the others yet about how their bucket bath skills are coming along, but just as I’m writing this I hear exasperated squeals and loud giggles from downstairs… it seems as though Vanessa just got a cold water shock, too. Life is full of newness. I see my group members becoming more sufficient at eating with their right hands (not left!). Many in my group have just taken their first stab at doing laundry in a bucket. We’re learning to navigate a new culture and its expectations, which means different adjustments for each of us. For me, the most notable adjustment has been dampening down my friendliness toward strangers on the street. Although the newness of Kotagiri has brought us much excitement this past week, a certain newness back home has brought us feelings of worry, disbelief, and sadness. Every day when news comes in, we share moments of shock, anger, and more rarely laughter (the laughter is typically associated with our President’s Twitter posts). We keep asking each other, as I’m sure folks back home are asking each other, what can we do? I was proud to hear that 10,000 people marched in Ithaca last Saturday. Yes, we all know Ithaca is a bubble, but I like to think it’s a well-intentioned bubble. 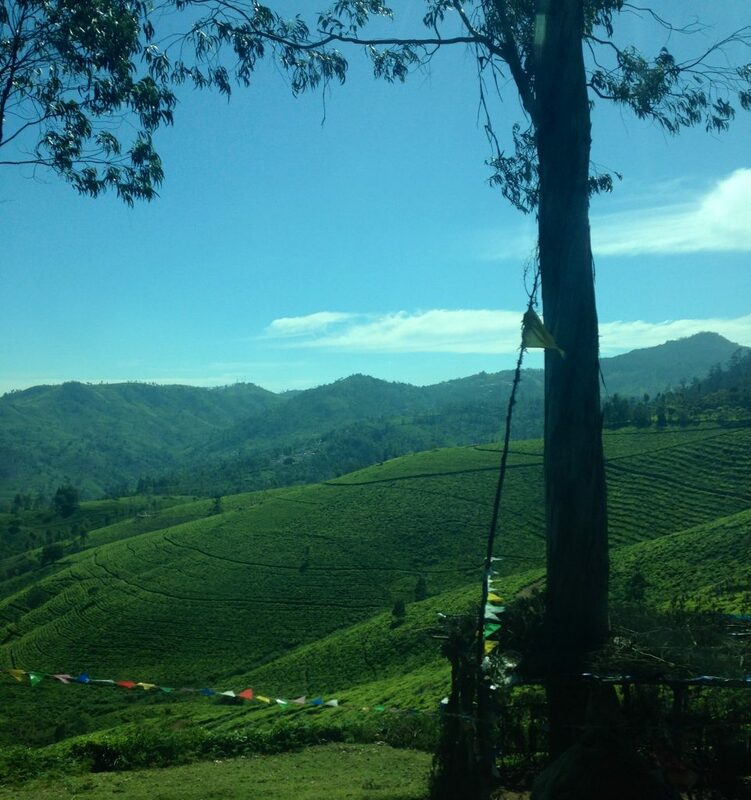 Tea fields dominate the landscape around Kotagiri and much of the Nilgiris District. More or less, it’s been a week of mixed feelings. I’m awed by the landscape of rolling hills covered by tea plantations, so productive and plentiful that the tea reaches the Ithaca Wegman’s. Yet, I understand that tea cultivation has replaced native grasslands, causing native flora and fauna to decline. Land use change has impacted the foraging of bees and bison alike. I’m intrigued by the Keystone students, who view the world so differently than we do. Our time together so far has been both eye opening and humorous. 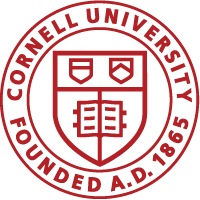 However, we recognize that we have many differences—differences in opportunities, differences in experiences, and differences in material possessions that create an unequal playing field in the classroom and in life. I wish I could shrink my privilege and pack it away, but I cannot. Despite our differences, I’m confident in saying that we’ve all been learning since the first day we set foot on Keystone’s campus. Our learning is of a new kind, and it squiggles so many different directions away from something I can define right now.